This week I began doing some volunteer work: childcare for children whose mothers are taking an ESL class. My hope in volunteering for this gig is that I can do at least a little bit of my Literacy Launchpad magic with these children. I'm presenting the books to the children in a casual manner, not forcing anything on them. 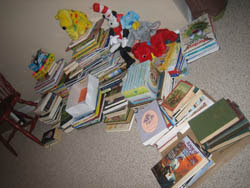 Last night I simply laid a bunch of books out on the floor, and asked them if they wanted me to read one. After I read one, they kept asking for more! The language difference is a bit intimidating. I'm not really sure how much of what I read and say they actually understand. And I speak NO Spanish... But they seem to be enjoying the books! Most of our time together last night was spent playing outside, so we didn't have time for any crafts or activities to accompany the books. I'm sure we'll have time for all that eventually. Here's a great article for everybody to check out. Read it and take some notes (that's what I did). And also note that it's written from a father's perspective. Dads as reading role models make a big difference in their children's lives! The Spring Hill Library is having their quarterly book sale this Saturday (Oct. 27th) from 9 a.m. till 3 p.m. The Williamson County Public Library is having their book sale from Nov. 1st through Nov. 4th during regular library hours. These sales are an inexpensive way to add some books to your child's home library!! Race ya there!! 1. I earn money. Obviously. Actually, I earn Amazon credit. It's not much, but it might allow me to get a book on Amazon every once in a while for free! And what's better than a book? A FREE book! 2. These widgets are informative. I like to mention and display the books we're reading (or have read) in class anyway. These widgets make it easy for you to see what we've read in class and access more info about them. 3. They encourage book buying. I strongly encourage you (parents) to be building your child's home library. If your child comes home from class talking about a book they really liked, I would suggest adding it to your home library. Amazon has great pricing on their books, and your child receives a fun package in the mail with one of their favorite books inside! 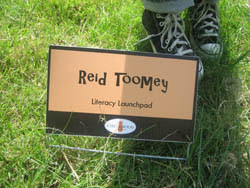 And if you're going to buy the book anyway, buy it through the Literacy Launchpad blog! You can click on the image or title of the book and it will take you directly to Amazon's website . This week's story, Go Away, Big Green Monster! by Ed Emberley, was a big hit! In this book, we slowly see a monster face appear as we turn each page. And then once we see the monster's complete face, we make him disappear! Upon finishing this read-aloud I always hear "Read it again! Read it again!" Ah! Music to my ears! And so we did read it again. During our second reading, I had the children help me create the monsters face in the middle of our circle. I passed out pieces of the monsters face (teeth, hair, eyes) and they had to listen for their piece to be mentioned in the story, and then add it to the monster's face. Then we played Monster Stomp! We took turns pulling words from our story from the "monster box," and reading the words aloud. Each word the box was a part of the monster's face, and there was a picture to accompany to word, which helped with the "reading." There was one piece in the box that I told them NOT to pull out - the piece with the monster's entire face on it!! Yikes! This piece scares me! But of course, the children all tried their best to pull that monster face out of the box on their turn. Every time somebody pulled out that piece we yelled "MONSTER!" and stomped our feet to get him to go back in the box. 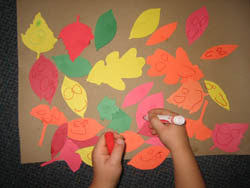 This lesson is SO much fun, not only for the children, but for me too! It allows me to use my amazing acting skills (O.K., maybe not so amazing...) and really ham up our activities. That's the best! Toward the end of the week, while were playing Monster Stomp, somebody pulled the monster from the box. So we all yelled and stomped, and when the monster went back in the box, I asked the children (using those amazing acting skills) to please not pull him out again because "my heart couldn't take it." Well, one of the little girls was really listening when I said this, and wanted to mimic my dramatics. So the next time the monster was pulled from the box she put her hands to her chest and said, "Oh! Don't take my heart!" to the monster! And she continued to say it every time the monster was pulled from the box. It made me giggle! Go Away, Big Green Monster! Is definitely another book they're going to be talking about for a while! I think next week's lesson is going to be great fun as well! I've been reading some other bloggers' posts about balance in their lives, and I am struggling with finding balance as well. I am seeking the optimal balance between fun and formal instruction in my lessons. See, the main goal I am striving for with all the classes and lessons I teach is motivation! I want these kids to LOVE reading and to WANT to read. Giving them meaningful and enjoyable experiences with books when they're young will hopefully be the foundation of a lifetime love affair with books and reading. There are also literacy skills I work on with my kids while we're having fun with our books and stories. And I strive to incorporate the learning and practicing of these skills into our lessons in a fun way. Sometimes that's easy, sometimes it's a challenge. 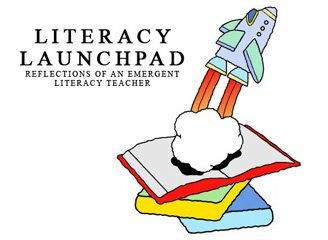 This is the third year Literacy Launchpad has been in existence, and this balance has been something I have struggled with since the beginning. How much formal instruction do I incorporate into class? Do I sacrifice fun to do that sometimes? I feel like I'm constantly torn between these two elements, sometimes feeling like I let one or the other monopolize my lesson too much each week. Anybody have any thoughts to share about this? Parents? Teachers? Anybody? Today was the big day - our first Literacy Launchpad field trip!! I would like to say a BIG THANKS to all the families who came out and joined me and Reid. I had a lot of fun. I hope everybody else did too. And the best part was getting to meet some of you, parents. That was really great for me, and I'm hoping that I'll get to see you guys some more in the future (the wheels are already turning for the next Literacy Launchpad field trip). I'm also hoping that I'll get to meet more parents. I know Saturdays are tough for many families because there's soccer and all sorts of things going on. Plus, our trip today was way up in Nashville, which is quite a haul for some families. Thank you especially to those of you who drove from far away to come today. This whole idea of field tripping came from a friend, Bryn. I was telling her that I wished that I could meet more of the parents of my students, and she had the brilliant idea of planning periodic field trips. Thanks, Bryn! Today's field trip was pretty brief. 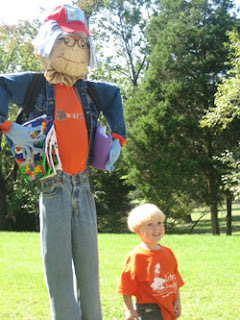 We met up, entered Cheekwood as a caravan, made a potty stop, then found Reid and read him a story. 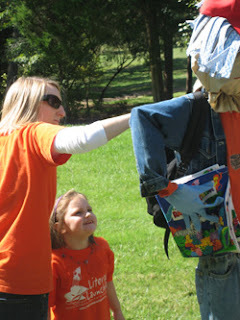 The parents and kids then had time to explore the gardens and the other scarecrows, which was nice. But I wish our time together had maybe been a little longer. Especially since some of the families drove so far to come. Ideally I would like these field trips to be a chance for parents to do something fun and literary with their child, meet-up with me, and also meet each other. So hopefully the next field trip will allow us some more time to chat and make some new friends. 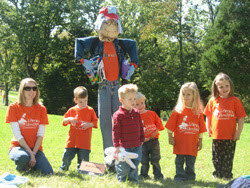 I have to say, story time at Cheekwood was a challenge today. being outdoors offers many distractions, and I worried I wasn't reading loud enough for my voice to carry to everyone. 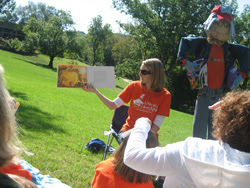 I also wished we had been able to discuss the story a little bit when I was finished reading (like we usually do in class), but we were all somewhat spread out and the kids were anxious to get up and go see the other scarecrows. So again, we'll see if we can work that out on the next field trip. 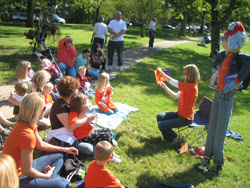 I was so glad to see some other, non-Literacy Launchpad families stop by as we were reading and listen too! They were honorary class members for the day! How fun! Roughly 10% of my students were there today for the field trip. It was a good size group for my first venture of this sort, but I would love to see more families come out for our next trip. I'll try to plan our next field trip at a more central location, which will hopefully make it more convenient for people. So if you're reading this, and you weren't there today... We missed ya! Come on out for the next trip! Here are some photos from today's trip! Man, I love my job!! 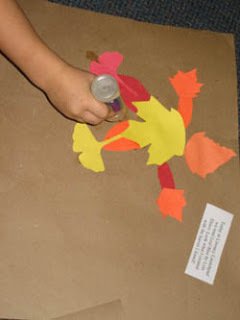 This week we read Leafman by Lois Ehlert. I had somewhat mixed reactions to this story from the children. I thought the illustrations in this story would really intrigue all the children, and they did intrigue most of the children, just some more than others. There wasn't as strong of a general reaction as I had anticipated. The group dynamic was a little different in some of my classes this week. We were in a different classroom than usual on Monday due to Columbus Day. And there were a lot of students absent this week, which makes the dynamic in class different. The kids all did really well with interpreting the illustrations in this week's book. They understood what was being created with the leaves in the illustrations, and understood that the creatures in each illustration were in fact created with leaves. They thought that was pretty cool. Re-reading last week's story was great because the kids remembered the simple text and read along with me. The best was when one of the children said, "I hear a peacock yelling at me" (recalling from the text). And then another child corrected him and said, "it's not 'yelling' it's 'yelping'!" These kids don't miss a beat! Another funny moment this week was when we were reading a page in Leafman that mentioned geese, and one little boy told me how he has seen "geeks" before. He told me there was a lot of "geek poop" in his yard from all the "geeks." Too funny! 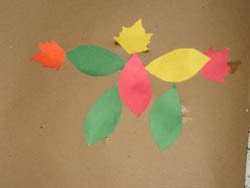 Here are some photos of the leaf creations of a few of my students. A couple of them actually took my book and used it as a reference for their leafman pictures they made, and they did an amazing job of recreating the leafman from the book! Check it out! Had family visiting from out of town this weekend. We took a trip to go visit Reid at his new home. I was happy to see some other families admiring Reid too while we were there. 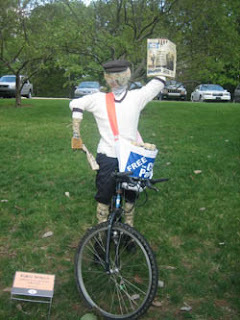 He seems very happy at Cheekwood! Reid with my sisters and me. 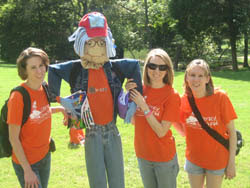 One of the other many scarecrows on display. 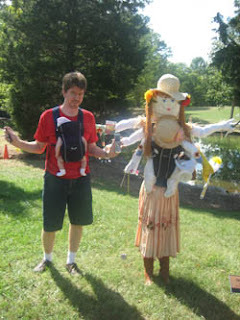 My brother-in-law with his scarecrow counterpart! I'm finally beginning to really feel settled in my new house. The little issues that pop-up when you move into a new place are dwindling. There are still issues to be dealt with, but not so many that I feel overwhelmed by them. I'm slowly easing back into reading my children's lit. listserv and blogs regularly, and it's so refreshing and encouraging. I'm feeling all inspired and revved up for October. I finally have an office to work in again, and not just an over-cluttered book-shelf and boxes of files in a corner of the living room (that's what I was dealing with at our temporary apartment). I have my desk back, and a closet to put all my supplies in! Granted, all my books have been unpacked and are stacked on the floor of my office, but I will hopefully be housing them on some new bookshelves soon. A trip to IKEA has been planned! 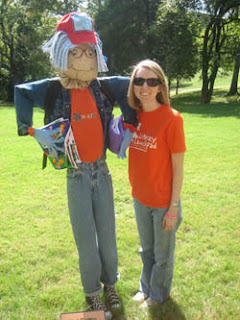 I'm still waiting to hear some responses about our Cheekwood field trip. I don't know if any families are planning to come. I sure hope they do! I'm looking forward to meeting some parents, and having a fun day out! 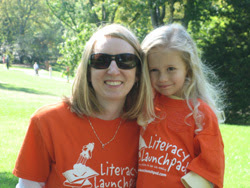 Literacy Launchpad meets three weeks each month, and there is no class this week. Awww! I know, I know, the week isn't the same without a good story from Ms. Amy, huh? Hee. Hee. I went to bring some flyers to one of my schools today, and of course my kids wanted to know if I was coming to get them for class. It's these kinds of moments that tempt my to give my best Sally Fields impression, "You like me! You really like me!" But, I think the reference would go over the heads of three-year-olds, so I tell them instead that we will be having class next week. This week I'm preparing my lessons for October, which are always some of my favorites! I just LOVE books about autumn. I'm introducing Leaf Man by Lois Ehlert next week, and I'm eager to see how the students react to it. I think they're all going to have a lot of fun with it. I'm not a fan of cold weather, but I do wish it would cool down just a little for our autumn lessons. Books about pumpkins and leaves should be read on cool, windy days, not on days when it's sunny and a high near ninety degrees!